Each female dolphin has her own unique mothering style. Some females are more protective of their calves, while others are more relaxed. The calf born in captivity is assessed by looking for good body weight and normal breathing patterns. Also, the mother's behavior will provide information as to the health of the calf. If the mother's behavior is relaxed and comfortable, it is a good sign. If her behavior is frantic and stressed, the calf may not be healthy. 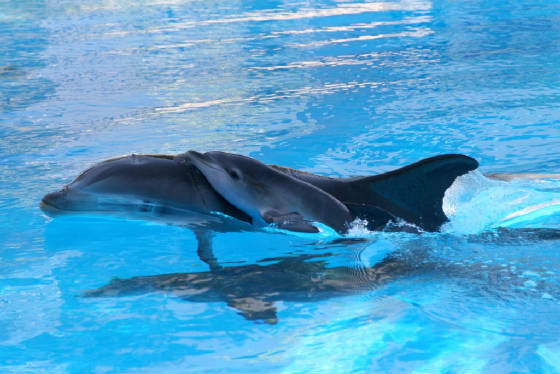 The cow, or new dolphin mother, experiences significant changes post-partum (following birth). One of the most significant changes seen with the new mother is the amount and pattern of sleep she exhibits after the birthing process. Studies by UCLA and Russian dolphin researchers have been performed to evaluate sleep patterns of the dolphin neonate and its new mother. Data collected from these studies suggest that new dolphin mothers get little to no sleep for at least the first 2 months post-partum. This is due to the vigilance needed to care for and protect the newborn. The newborn, on the other hand, sleeps extensively during this time. The neonate calf will swim with the nursing adult (mother or other female capable of nursing the calf) in one of two positions. The “echelon" position is alongside and slightly above the adult. This position provides a slip stream (low pressure area) in which the newborn uses less energy to move forward (much like racing cars “drafting” behind each other). The “feeding" or "nursing" position (also called the "baby" position) is underneath and in close proximity to the nursing female’s mammary glands. This provides a “ready” position when the calf attempts to nurse and is thought to provide an important camouflage position against its mother's larger body when distracted during nursing. A nursing calf will often spend 4-5 seconds receiving milk on one side, then switch to the other mammary gland for a similar period. Its mother's milk is rich in fat (10-20%). Activities such as respiration and swimming improve as the calf ages. Calves are “opportunistic” in their feeding, nursing from whatever female is available to supply mammary milk. In the wild, even when females from other geographic locations are introduced into a nursery pod, calves will quickly approach these females and nurse from them. This implies that the social group is more important to the calf than the geographic origin of the visiting females. Adult females in nursery pods may keep calves in a protective "playpen" for added protection. A calf whose behavior warrants discipline may be "buzzed" by its mother using sounds and may be held near the bottom until it gets the point. It is well known that dolphins sleep by lowering the activity in one hemisphere (half) of their brain (the resting side), while the other hemisphere remains actively communicating the command to breathe and to be alert for predators. This has been verified by using EEG (electro encephalogram) instrumentation to measure brain wave activity. As the mammal brain is cross-functional in its control of bodily activities (the left side of the brain controls many right-sided functions and vice-versa), dolphin sleep is monitored by observing eyelid position. A closed or partially shut eye indicates the opposite brain hemisphere is resting. This is called having a "cross-ocular connection". The asymmetrical eye state resulting from the animal's cross-ocular connection is the most commonly accepted indication of a sleeping dolphin. Newborn dolphin calves attempt to swim synchronously (in tandem) with their mothers. When sleeping they keep visual contact with their mother by positioning the side with the open eye next to her. This sentinel function of the asymmetrical eye state in the sleeping dolphin has been observed with wild dolphin schools where schoolmates will position themselves so that they can keep the one open eye in contact with each other. Instead of resting on the surface while sleeping, new mothers swim continuously with their neonates during the initial post-partum weeks. Any changes in direction or speed by the mother are responded to in kind by the neonate. This allows the mother and calf to visually monitor each other’s position continuously. Dolphin calves appear to show a strong instinct for continuous swimming in their first few months. This is necessary for a number of reasons: (1) it makes the calf less likely to be a target of predators, (2) the calf lacks a developed layer of blubber and does not have the buoyancy control of an adult and would have difficulty keeping a stable position in the water, and (3) without a thickened layer of blubber it cannot thermo-regulate its body temperature and must use the temperature of water flowing over its body surface to maintain homeostasis (a steady body state). Another research observation when studying the new mother and calf is that during the first 2 weeks following birth the newborn calf surfaces synchronously with its mother, but by the end of the first 4 weeks post-partum the mother is surfacing less frequently for a breath than the calf. The more frequent surfacing of the calf, when not in synchrony with its mother, requires the calf to accelerate after each breathing episode to catch up with her. Studies of sleep deprivation in land mammals indicate consolidated (uninterrupted) sleep is required in the terrestrial neonate for proper growth and development. Without consolidated sleep, terrestrial mammals develop psychological and biochemical abnormalities. On the contrary, studies of dolphins show the lack of consolidated sleep does not affect brain development in the dolphin neonate. An infant begins to develop a "signature whistle" shortly after being born. 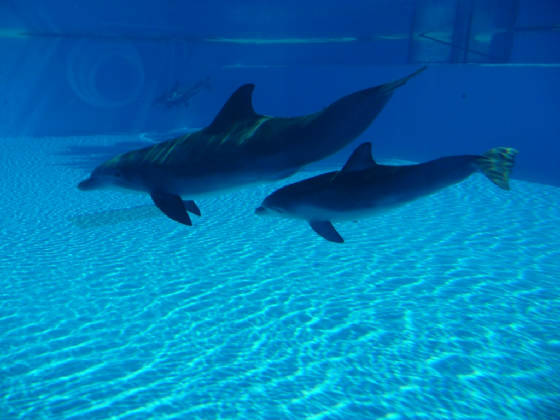 Calves have been reported to develop whistles similar to their mothers or similar to other dolphins within the nursery pod in which they were born. 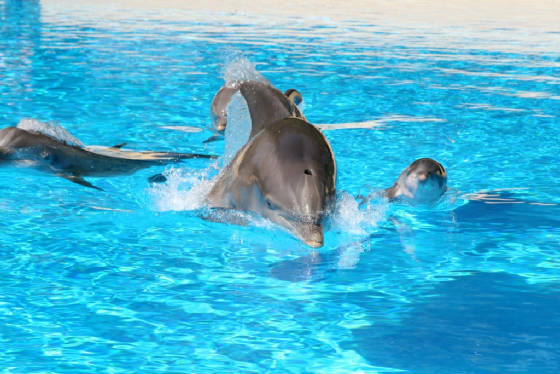 Captive dolphins' whistles differ from those produced by wild dolphins. Captive dolphin whistles tend to be shorter than their wild counterparts, perhaps due to the use of bridges (mechanical whistles blown to indicate correct behavior) by dolphin trainers. After some time, the calf will begin to swim at longer and longer distances from its mother. This presents risk to the calf to do this. It is believed that the calf accepts this risk in return for the opportunity to develop social relationships with other dolphins in the pod. As has been addressed earlier, the diving and thermo-regulation limitations of the calf can help us to understand some of the ways in which the adult female dolphin responds to her offspring's handicaps. When a calf dies, mother dolphins have been observed mourning their young, much like is seen in other mammals. The following video documents this behavior.